No doubt that at some point you have done a workout so painful that it feels like your arms and legs might just explode. The burn; the heaviness of your limbs; the pressure on the skin; they are all just so much more intense than after a standard workout. So surely this pain must be doing some benefit? Let’s explore this in more detail and study the science of anaerobic exercise, ‘lactic acid’ and horrendous muscle burn. Just what is ‘anaerobic’ exercise? The word ‘aerobic’ come from Greek origins, meaning ‘aero’ – air and ‘bios’ – life. It is used to describe living in the presence of oxygen. Hence, ‘anaerobic exercise’ is exercising without the presence of oxygen. That is not to say that you are exercising in a vacuum, but rather that the predominant energy production for the exercise taking place is happening at such a rapid rate that the aerobic (think long duration oxygen based) energy system can’t completely meet the demand. Enter the anaerobic system. We have 2 anaerobic energy systems, the first (ATP-PCR or A-lactic system) lasts approximately 6-10 seconds and the second (Anaerobic Glycolysis or ‘lactic acid’ system) lasts 1-4 minutes. How do we get our energy for movement? When we produce energy aerobically, we utilise energy sources and oxygen to transform our food’s chemical energy into our muscle’s mechanical energy. It is important to note that all processes requiring energy in our body only use Adenosine Triphosphate, or ATP for short. Think of this as the energy currency of the body, but more on ATP in future posts. This process creates the bi-products of water and carbon dioxide. 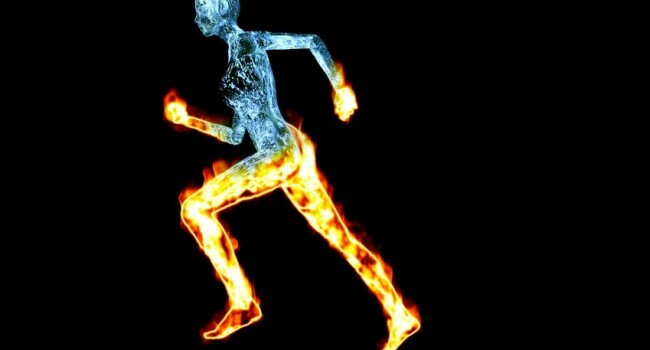 Think of the aerobic energy system as a log fire, burning at a slow, continual rate with no drastic changes in intensity. Our A-lactic system creates no direct bi-products, however does require energy to replenish our stores of Phosphate creatine (PCR). Phosphate creatine acts like the equivalent of food energy sources, but the a-lactic energy system can only utilise PCR to refuel and replenish. Think of the a-lactic energy system as petrol poured on the fire; a brief explosion of energy that quickly dies down back to lower intensity. Then we have our ‘lactic acid’, or anaerobic glycolysis, system. Think of the lactic acid system as somewhere between petrol and a slow log fire, almost like diesel poured on a fire; higher intensity flame, but not as rapid of an explosion. Unlike the aerobic and a-lactic systems, the lactic acid system does create some painful bi-products. The breakdown of glucose causes a release of Hydrogen ions, which are effectively the ‘acidic’ part of an acid. There is also a bi-product known as lactate produced, which is where the term lactic acid comes from. What lactic acid is, however, is lactate and hydrogen ions. Lactate is broken down to pyruvate and then used for aerobic energy production, making it quite a useful bi-product. Where the burn in the muscles comes from is the accumulation of Hydrogen ions within the working muscle. 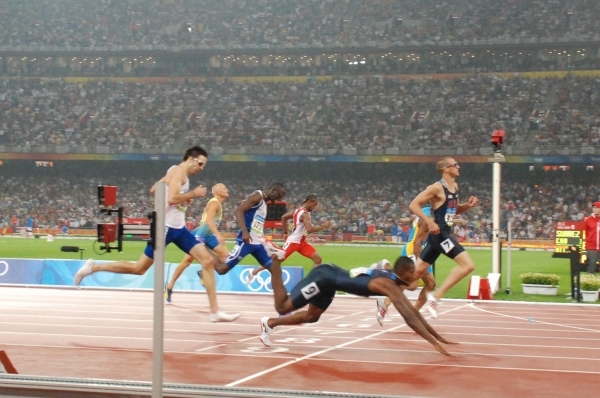 This happens because the intensity of work undertaken by the lactic acid system is high enough that hydrogen ions are produced faster than they can be ‘buffered’ by the blood, so we get an increasing Hydrogen ion accumulation with a decreasing concentration gradient between the muscle and the blood, during prolonged anaerobic activity. Some aerobic endurance activities also cause a lactic burn. But if we aren’t ‘anaerobically’ producing energy, why would it be burning? This is where it is important to understand that all 3 of our energy systems work simultaneously at all points in time, but the percentage and degree to which they contribute to energy production varies based on intensity. At rest, predominately aerobic; 100m sprint, almost entirely PCR during the sprint. What about high intensity, long duration intervals? 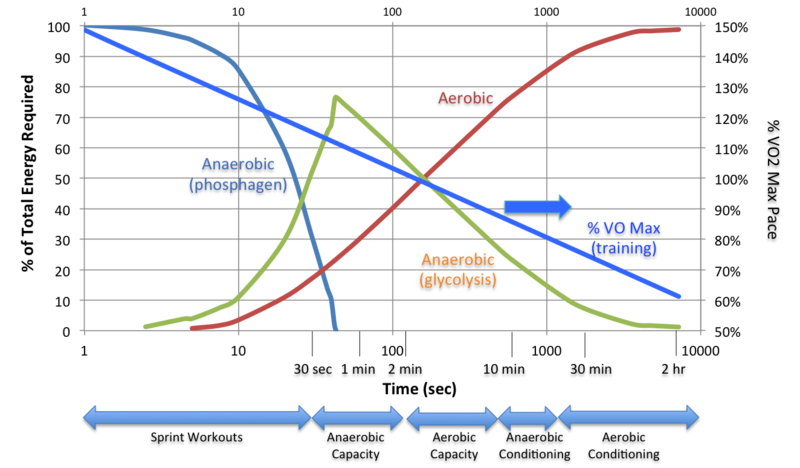 As we increase our heart rate, our reliance on anaerobic energy sources increases in proportion to our aerobic output. This means that if you were to run 1500m intervals at maximum effort, for 3 repeats, by the end of the second repeat your legs would feel like they’re on fire. This is all due to the hydrogen accumulating in the muscle, as it is being produced faster than it can be removed by the body. Diagram below represents the energy systems in response to activity of varied durations and intensities. So, what does that mean for us as athletes and regular exercisers? Effectively there are two training factors that come of high intensity aerobic training that can help improve our speed and pain tolerance. By training at such intensity that we create lactic burn in our muscles, we are slowly teaching ourselves mentally and physically to better tolerate this level of pain. With time we can then achieve higher lactate levels, and push further into the anaerobic conditioning training zone. Simultaneously, we are training our body’s response to lactate and hydrogen accumulation, such that our body gets better at removing hydrogen at a faster rate than before. This allows us to tolerate the same, or an increased level of pain, while performing at a slightly higher intensity. This can in turn improve performance, speed and power at peak aerobic output. So get out there for a workout, and next time you feel the burn enjoy it, embrace it and think of all the adaptations going on inside your body. Any questions, or want to know more? Get in contact today!